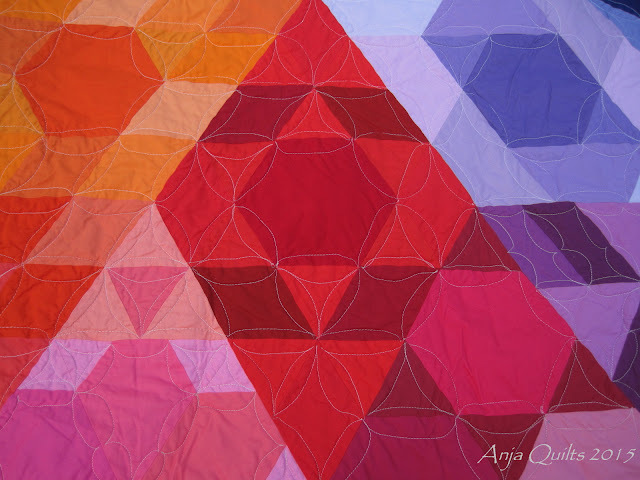 Anja Quilts: TGIFF - Whoomp There It Is!!! TGIFF - Whoomp There It Is!!! "There's a party over here, a party over there. Wave your hands in the air." I'm waving my hands and doing a happy dance. Gravity is finished!!! 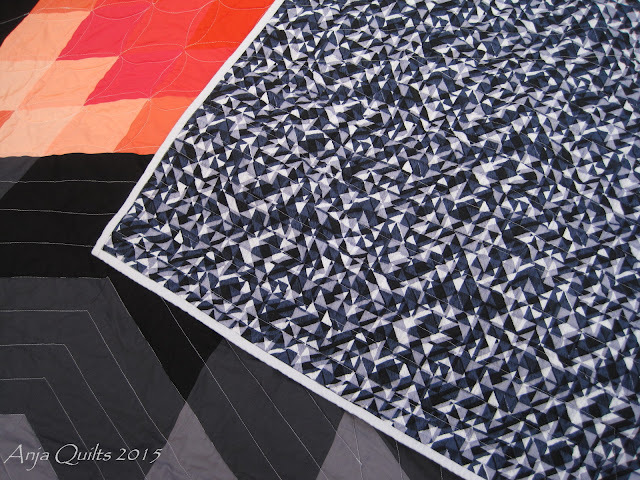 I had some doubt that I would be able to quilt this 97-inch square quilt. There were a few frantic late nights of sewing earlier this week. I had to fold the edges over to fit it on the longarm, and then I did the background sections on my little Singer. Gravity will be taking up permanent residence on my bed. 114 Kona colours were used in the making of this quilt -- 108 colours for the blocks and 6 colours for the background. Woo hoo...lots of colours to cross off my list. A closeup of the quilting. 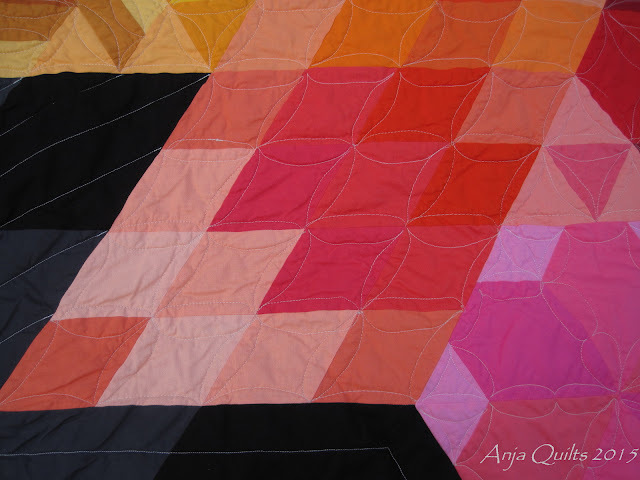 I need to practice my skills in quilting curves. It's not perfect, but I'm happy with it...because she's finished!! I followed the quilting plan for the background sections from Tamarack Shack. Thanks to Myra @ Busy Hands Quilts for hosting this QAL. It was fun to sew along with others, and the timelines were very manageable. Stop by to say hello and to see the other Gravity finishes. The backing is wide back Prisms by Studio E Fabrics. Now it's time for your finishes. Post your finished project using the linkup below. Don't forget to visit some of the other finishes and share some love and encouragement. Please include a link and/or the TGIFF button in your blog post so your readers can also view all the great finishes. Congratulations on the Gravity finish! I'm dancing with you! So impressed that you quilted your own GIANT quilt. This is gorgeous, and well done for quilting it yourself! Congrats on Gravity's finish!!! It's a BIG finish for sure. I love all the colors you used and think the quilting you chose looks great! wow, how beautiful is that! you'll love looking at that on your bed for years and years to come! I love this! You did a great job! That backing fabric could not be more perfect :). Congratulations on a beautiful finish! It looks stunning. Thanks for hosting TGIFF. Congrats on such a spectacular finish - it's gorgeous! Having followed along your progress all the way on this Ia m delighted for you! Turned out great. Congratulations it is spectacular! and a bigger congrats for quilting yourself! Congratulations Anja! What as amazing finish! Great finish! I love the quilting on this one. Stunning quilt, congrats on the finish and especially for your own bed! Beautiful finish! The choice of the quilting motif could not have been more perfect. Congratulations!! Congratulations on the finish, Anja! It's so gorgeous! Anja, this is fan-freakin-tastic! beautiful finish! Amazing finish, Anja! Cheering and dancing with you - this quilt is a stunner. Bravo! Have I mentioned how jealous I am that you get to cross off that many Konas? Ack. I must finish QPP Project #1 before they add more colours (no, I haven't heard any rumours). If only there were a smaller size of this one, I'd be even more tempted! There's no way I could quilt that behemoth! Congrats on this finish, it is beautiful! It will look beautiful on your bed! This turned out beautiful! All those colors are gorgeous and congrats on the quilting! I think it looks fantastic! YES! WHOOMP There IT Is!!! Amazing finish Anja! It's a LOVELY quilt. You go girl! Congratulations on a spectacular finish. I love.....love....LOVE it!!! The quilting is amazing! You outdid yourself with this beautiful finish. Well done! 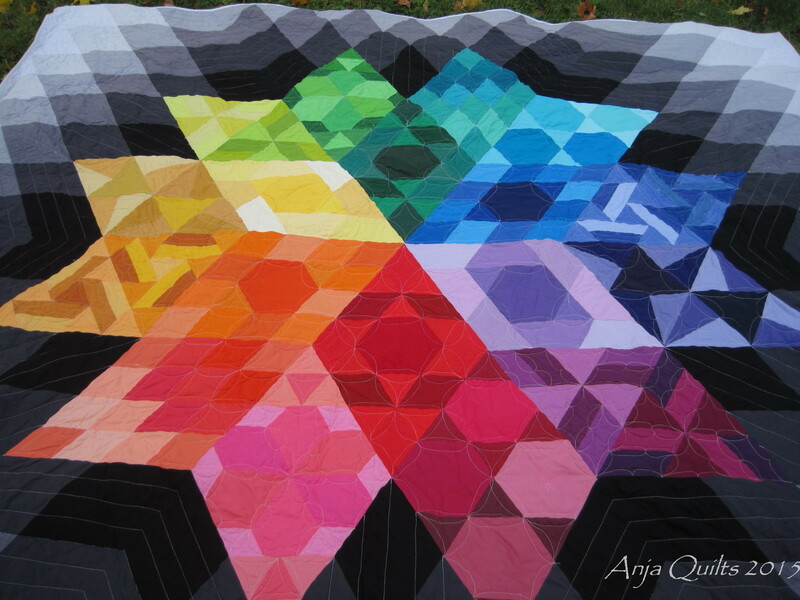 I've fallen head over heels for your Gravity quilt Anja! You did an amazing job with it!